Your guide to shopping until you drop in Vancouver, B.C. If the low Canadian dollar has you thinking about a trip north of the border, now’s a good time: Vancouver is pretty this time of year and offers some excellent shopping to boot. Sometimes, you travel to see the world and experience its wealth of art, culture and scenic beauty. And sometimes, you just want to go shopping. If the low Canadian dollar has you thinking about a trip north of the border, now’s a good time: Vancouver (my hometown) always looks awfully pretty during the holidays, if you don’t mind a little dampness. The drive from Seattle to Vancouver, with no traffic at the border, is about 2½ hours. I’ve done it in less, but I don’t recommend it; speeding tickets are expensive. Border traffic varies wildly; check wait times at bwt.cbp.gov. Other ways to get to Vancouver: see seattletimes.com/travel. The fine print, U.S. Customs edition: If your trip is less than 48 hours, you are eligible to bring back $200 (U.S.) worth of merchandise per person without having to pay duty on it at the border. Anything over that might be subject to additional fees. If you are gone more than 48 hours, your exemption increases to $800 per person. See cbp.gov for more information on what you can and can’t bring back. As of this writing, the Canadian dollar is worth approximately 75 cents U.S., so when you see a price tag, mentally deduct 25 percent. Note, though, that B.C. sales tax is high: 12 percent for most items. A note, before I dive in: Vancouver is, of course, crawling with American chain stores and, because of the low dollar, you might find slightly better prices at them, post-conversion, than at home. But mostly I’m not mentioning any of them here. You didn’t go all the way up to Vancouver to shop at The Gap, did you? If you only have time for one neighborhood, go here: Tucked underneath the Granville Street Bridge on the banks of False Creek is a wealth of restaurants, pubs, galleries, theaters, a public market, craft vendors and unique shops (for an overview: granvilleisland.com). Among them are my mother’s favorite, the irresistible Granville Island Broom Co. (1406 Old Bridge St., 604-629-1141 or broomcompany.com), where the brooms are crafted right in the shop using Shaker weaving methods. Various styles and handles (including wickedly twisty ones that could do double duty on Halloween) are available; small brooms start at around $32 Cdn. Wander around the island (a peninsula, really), buy a snack in the public market, and poke your head into the various buildings. There’s particularly good shopping in the Net Loft (1666 Johnston St.): I like the sumptuous stationery at Paper-Ya (604-684-2531 or paper-ya.com), the whimsical headwear at Granville Island Hat Shop (604-683-4280 or thehatshop.ca), and the Postcard Place, a tiny shop that sells, yes, just postcards (604-684-6909). If you have children in tow, take them to the Kids Market (1496 Cartwright St., 604-689-8447), a warehouse full of extra-family-friendly shops and activities. And stop in at Rogers Chocolates, a Canadian institution (est. 1885, as its neon sign tells you), for an ice cream or a prettily packaged box of treats: 1571 Johnston, 778-371-7314 or rogerschocolates.com. It’s been the talk of Vancouver for a while: Yes, the city now has a Nordstrom, right smack in the middle of downtown at Granville and Robson, and it looks just like Nordy’s as we know it except that it’s more crowded and the prices are in Canadian dollars. Skip it, unless you’re looking for lunch (restaurant on the third floor; nice views). More interesting, and less pricey: the vast Hudson’s Bay Co. department store, known locally as The Bay, which sells a cheery assortment of woolens and gifts in its trademark red, yellow and green stripes. (I almost bought an adorable pair of striped toddler mittens for a mere $7 Cdn. on sale, despite lacking a toddler.) Look for the HBC Collection shop on the main floor; 674 Granville St., 604-681-6211 or thebay.com. Across the street is Canada’s most posh department store, Holt Renfrew (737 Dunsmuir St., 604-681-3121 or holtrenfrew.com), which is fun for browsing high-end designer goods. Nearby is Robson Street (pronounced robb-son, not robe-son; you’re welcome), which for some reason has a reputation for being Vancouver’s best shopping street. Maybe it is, if you like crowds and chain stores. Head instead to historic Gastown, just a few blocks’ walk from the downtown department stores, where a steam clock on Water Street chimes the hours and where every brick building looks like it could tell a racy Victorian story. Lots of restaurants, gift shops and furniture and home-décor stores here to keep you busy, but my favorite stop is John Fluevog Shoes, a since-the-’70s local legend (now international, with a Seattle store) housed in a soaring former courtyard: 65 Water St., 604-688-6228 or fluevog.com. Plain shoes must dream, at night, of looking like Fluevog shoes: all quirky angles and whimsical detail. I sighed after the Elisabetta, with its black velvet bows — but, at $339 Cdn., the pair remained a dream. 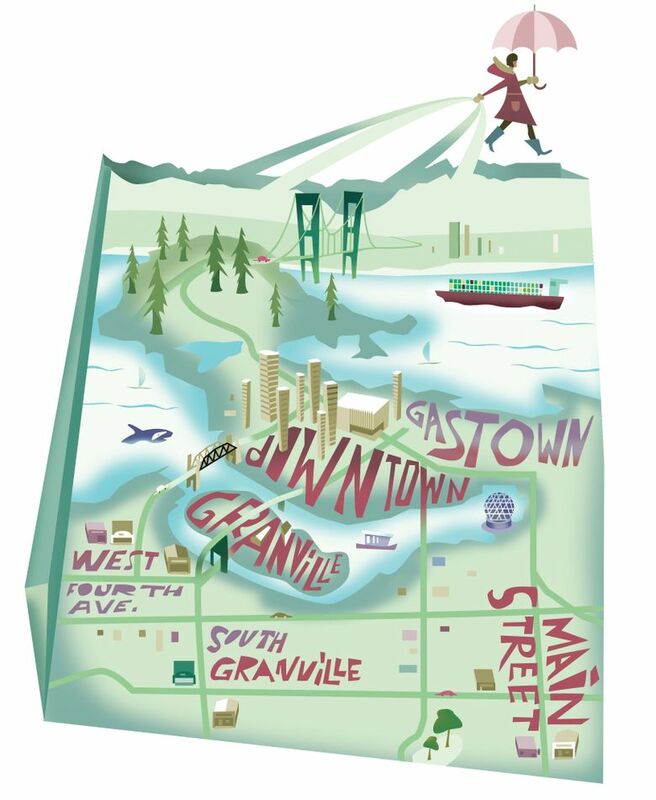 Don’t let the name fool you: Vancouver’s Main Street, in the residential east side of town, is mostly nonbustling. It’s the kind of neighborhood where the antique stores look as if they’ve been there for decades (as some of them have), pleasantly gathering dust. Pop into any one of them for a possible surprise, such as the mound — there’s no other way to describe it — of antique gramophones I spotted at J&J Antiques (4394 Main St, 604-708-1975). Aside from the antiques, it’s a great gift neighborhood. The GivingGifts co-op features an assortment of fair-trade, eco-friendly wares, from jewelry to stationery to scarves (4570 Main St., 604-831-7780 or givinggifts.ca). Barefoot Contessa, a soft-hued haven, has silver necklaces made from antique spoons, chubby teapots dressed in cable-knit sweaters and festive nipped-waist party clothes (3715 Main St., 604-879-8175 or thebarefootcontessa.com). Nineteen Ten Home Boutique had my favorite potential stocking-stuffer of the weekend: a package of 12 of the prettiest floral-print pencils you’ll ever see for $16 (4366 Main St., 604-558-0210 or nineteenten.ca). And The Regional Assembly of Text not only has the most irresistible shop name ever, but sells charming boxed cards, notebooks, and membership in its Tiny Book of the Month Club, which somebody you know might need (3934 Main St., 604-877-2247 or assemblyoftext.com). When I was growing up in Vancouver, Fourth Avenue in the Kitsilano neighborhood was where you went for funky, unique shopping; now it’s dominated, for some reason, by athletic/outdoor-clothing chains. (Lululemon, by the way, was born right here in Kits, and it’s still here.) It’s still worth a stroll, particularly if you’re low on yoga wear. Among the outliers in this forest of leggings is a Roots outpost: a Canadian chain offering good-quality leather goods and men’s and women’s clothing (2091 W. Fourth Ave., 604-629-1195 or roots.com). Also, the gift shop Oh My Gift has a pleasantly girlie assortment of the usual suspects — candles, bath products, picture frames, decorative objects — as well as throw blankets, socks and knitwear in soft but vivid hues from the Irish weaving firm Avoca (2039 W. Fourth, 604-733-0008 or ohmygift.ca). Other favorites: Murchie’s Tea and Coffee, the company that’s been supplying the Lower Mainland with everything needed to make a nice cuppa since 1894 (110-1501 W. Broadway at Granville, 604-733-2281 or murchies.com); Ming Wo, for the well-appointed kitchen (2707 Granville, 604-737-7885 or mingwo.com); and Country Furniture, where you’ll covet things that won’t fit in your car (cushy chairs, sturdy tables) but will find an assortment of irresistible items that will (3097 Granville, 604-738-6411 or countryfurniture.net).